I don't get off work till 7 hopefully i make it home in time. Saw the first one and couldn't believe the result like most. Last time I was buzzed too or had any significant amount of beer. Been some time. Bradley is a shot fighter. Arum knows this, it's why the fight is happening. 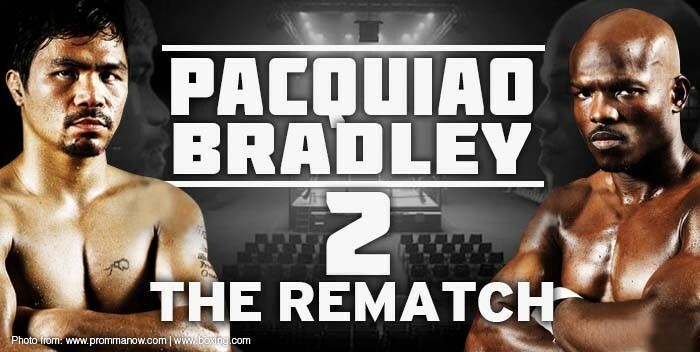 Pacquiao will win and win easily, likely stop him. Bradley imo hasn't been the same since the Ruslan Provodnikov fight, physically or mentally. That fight I think took a LOT out of him, even listening to him after that fight or now he seems 'shocked' a bit. Imo he's done and Pacquiao will finish what's left tonight. If he doesn't he needs to retire. Edited by Majesty, April 12, 2014 - 03:57 PM. Don't expect HD quality of course, lol. Bradley being a little dumb taking risks being cocky putting his hands completely down. Manny's Mother trying to put a curse on Bradley. Bradley's been terrible the second half of the fight. Too cocky for his own good. ^ Couldn't agree more. Moron. The worst part is Pacquiao isn't really showing anything special and Bradley is willingly giving this freaking fight away for sake of being a "warrior" UGH!!! I feel bad for anyone that paid 60 for this BS. Lol. Manny's Mother hugging Bradley after the fight despite trying to put a curse against him during the fight.